Reverse digits of an integer. The problem looks simple but it's not simple there are many things you need to consider in order to produce a solution which is accepted by LeetCode, which has thousands of test cases to test your solution. For example, you need to consider not just about positive integer but also about negative integer. Remember, a positive integer can also be written using + sign, so you need to handle that as well. If the integer's last digit is 0, what should the output be? i.e. cases such as 10, 100. If the return type of method is an integer then you can simply return 1, it's perfectly Ok, but if the return type of method is String then you may need to return 001 or 0001. For the purpose of this solution, we expect our method to return an integer, so 1 is fine. Here is my Java program to solve this problem of reversing integer number without using any direct library method. The crux of this problem is how to use division and modulo operator in Java to get the last digit of a number and get rid of the last digit as well. If you remember, I have shared this trick before when I was explaining how to use modulo operator in Java. This is a really neat trick and will help you to solve many programming problems where you need to divide numbers into individual digits. When you divide a number by 10, you get rid of the last digit, for example, 211/10 will give you 21, and 21/10 will give you 2, so you got rid of last 2 digits by dividing your number by 10 twice. You can see by multiplying number by 10 you increase number of digits by 1 and then add last digit. For negative numbers, we multiply it by -1 to first make it positive and then apply same logic, while returning number we just multiply it by -1 again to convert the reversed number into negative. * Java Program to reverse Integer in Java, number can be negative. * which this method doesn't handle e.g. integer overflow. You can see that output is the just reverse of input. The first digit has exchanged position with last digit, second with second last and so on. 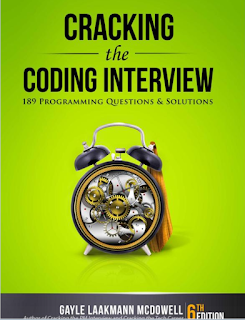 By the way, if you are solving LeetCode problems as part of your interview preparation then you can also see Programming Interviews Exposed and Cracking the Coding Interview, two of the most useful books for preparing programming job interviews. You will learn more in a short time. 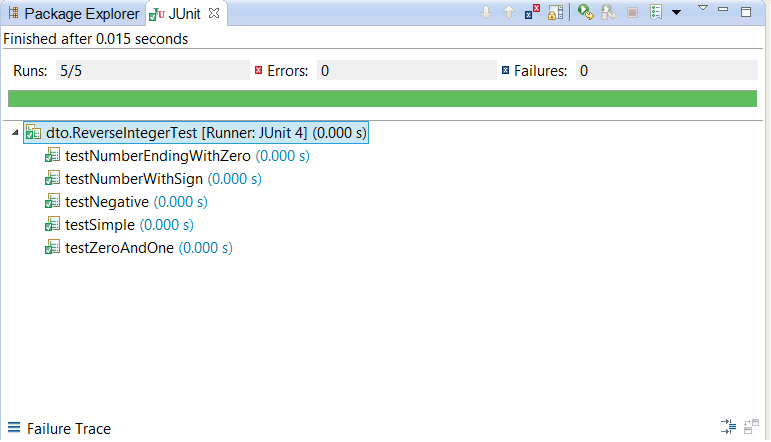 Here is my limited set of JUnit tests for checking my solution. It checks for input zero and one, a simple positive number, a negative number, a positive number with plus sign and number ending with zero. Our solution passes all the tests but it's not enough. If you submit this solution on LeetCode it only managed to pass 1028 out of 1032 test cases. Yes, you read it write, they have 1032 to test this problem, no wonder our solution failed. FYI, it failed for input 1534236469, see if you can spot the bug and fix it. 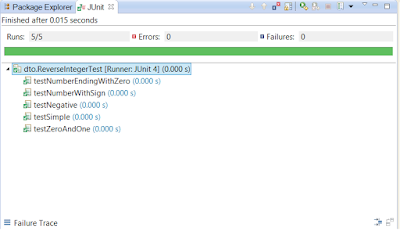 * JUnit test four our solution to problem of reverse Integer in Java. You can see that lovely green bar, which means all five tests are passed. That's all about how to reverse Integer in Java. By the way, this solution is prone to integer overflow and will not be expected at Leetcode. It only managed to pass 1028 test cases out of staggering 1032 tests and failed for input 1534236469. Expected solution, in that case, is zero but our program print something else, see if you can spot the bug and fix it. Hint : Leetcode is OK if your function returns 0 when the reversed integer overflows. Since our code doesn't handle integer overflow like this, I left this as an exercise for you guys to fix. why is this step needed?